Lee Zimmer — Laguna Beach Live! Lee Zimmer is a virtuoso performer who has delighted audiences with his elegance and sense of musicality both as a soloist and ensemble player. Lee has performed and taught guitar for most of his life. Currently, he is adjunct professor of guitar studies at both La Sierra and California Baptist Universities. Lee also is music department chairperson for the Fender Center’s Kids Rock Free program, where he developed the current curriculum for guitar, bass, and band studies. 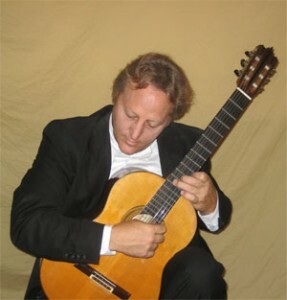 Mr. Zimmer studied classical guitar for several years with Maestro Seiko Sesoko. Along with that, he has performed in Master classes with Manuel Barrueco, Sharon Isben, David Russell, Michael Newman, and Jorge Morel. As well as performing and teaching, Lee has arranged music for one, two, and four guitars. His arrangement for two guitars of Le Tombeau de Couperin, by Maurice Ravel, is featured on a CD that he recorded along with guitarist Eric Brenton as Duo Sesoko. Lee has a solo CD entitled encarnacion which features the guitar music of Federico Moreno-Torroba, Agustin Barrios, Manuel de Falla, and others. Mr. Zimmer was recently an invited guest performer at the international festival, Experiencing Villa-Lobos, held in Virginia. Since 1985, Lee has been on the board of directors for the Orange County Guitar Circle, a guitar society that has been in existence for over 30 years. He was the president of the organization from 1996 to 2005.